You can find here an animation rig in Blender for the male NPC. If one wants to make animations for TDM in Blender this will be very helpfull. 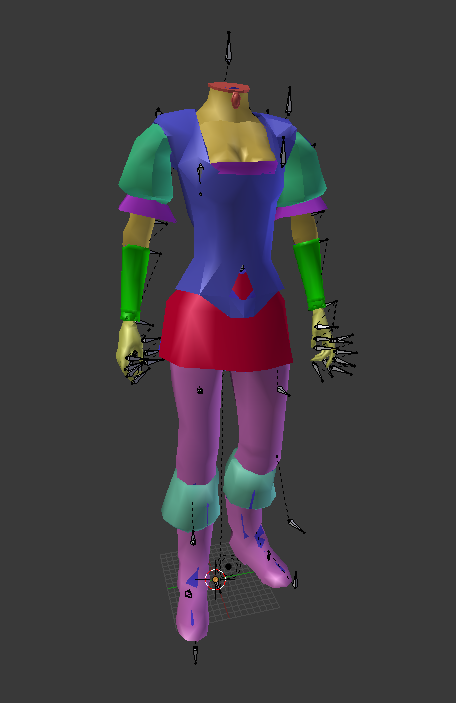 EDIT 2014.05.28: I also made a female version of the rig. It's a bit different than male version. See this post for details. EDIT 2014.08.02: I did a small change to male rig. Link has been updated. Also added some new animations. It's the same bones as the game model plus many more bones. Use this rig to make animations. Rig from layer 3 will automatically copy all of its movements. In order to export the animation you will have to first bake it. Chose the rig from layer 3 and press space bar and type in "Bake Action". This will be very useful for people using Blender; thanks very much! It looks incredibly useful, but I don't have enough information how to use it. I made a simple test animation, I go to layer 3 and select the normal skeleton (looks like the one I've been animating previously). Space, bake action, set the end frame, uncheck "Only Selected" to get all the data, Bake data: Pose. OK. Select all the proguard* meshes. Select skeleton from layer 3. File/export/md5 exporter. I get an error message "Object 'int' has no attribute 'animation data'." Any ideas? The dopesheet shows all the movement information for the normal skeleton (layer 3) and exporting should work similarily to my workflow with the previous animations. Running out of time now, but I have a feeling it might be related to that the normal skeleton is not visible in the dopesheet. Only your special rigging armature control is present there. That's the only big difference I am seeing between my working setup and your rigging blender. Okay, now I got it to export... Not sure what I did, maybe adjusting the layers that are visible in the other window. The anims seem to work ingame, but unfortunately the shadows wink off for the duration of the animation. Nothing seems to help with that. Yes, the workaround for that I used was to import the md5.anim to Blender 2.49 and export again from there. That will fix the shadows. Sounds like it's not exporting the shadowmesh for some reason. That's not it. Shadowmesh is in md5.mesh not in anim. Also, the shadow is there but it sometimes disappear. It's a really weird bug. Hooray! Got it to work. 3) Import the anim from step 2) into another version of blender that has an import script (blender 2.61). You need to have a md5 mesh open in the blender file, of course. Save the work into a blender file. 4) Open the blender file from step 3) in blender 2.63. Shadows are working, animation is working. I only need blender versions 2.63 (has an export script) and 2.61 (has an import script). Benefit is that one does not need to use much older versions of blender. Theory: The presence of the Arcturus custom rig in the blender file somehow affects the md5 export, resulting in a shadow-defect in the animation file. One must import the animation and export it again from a blender file that has nothing else but the animation and the mesh. This generates a 'clean' animation file. What this means, someone more wise can tell. Or then it is just a mystery that does not need to be solved, because we can sidestep it with some extra workflow. How can I get this pose as a starting point in Arcturus' rig? If I import an md5anim that has this pose into Arc's rig, I get a mess. If I open a blender file with this pose and copy the pose and try to paste it into Arc's rig, I don't get the same pose, but something incorrect. How is the armature control linked to the normal armature in layer 3? Could one reverse the linking so that I could change the pose by pasting the starting-point-pose into the layer 3 skeleton and the armature control skeleton would adjust accordingly? Possibly the best solution is simply to pose it manually as close as possible. It shouldn't be noticible in game if the difference is small since there's a couple of frames of blending between animations. I edited the first post. After couple of days it will be deleted again. Somebody should put it on our servers. As the file is so small it could be uploaded to our wiki with a small article based on your second post. Yep, it's 5,21 MB after unpacking. Hey, it turned out my shadows are still borked during animations. The md5 exporter does something wrong with the newer versions of blender I am using. Could you please write detailed instructions how I install the md5 import and export scripts to blender 2.49 and how I import and re-export the anims? I cannot use this version of blender at all, I cannot find even a way to install the scripts. I found a md5 exporter script that works for Blender 2.68a. 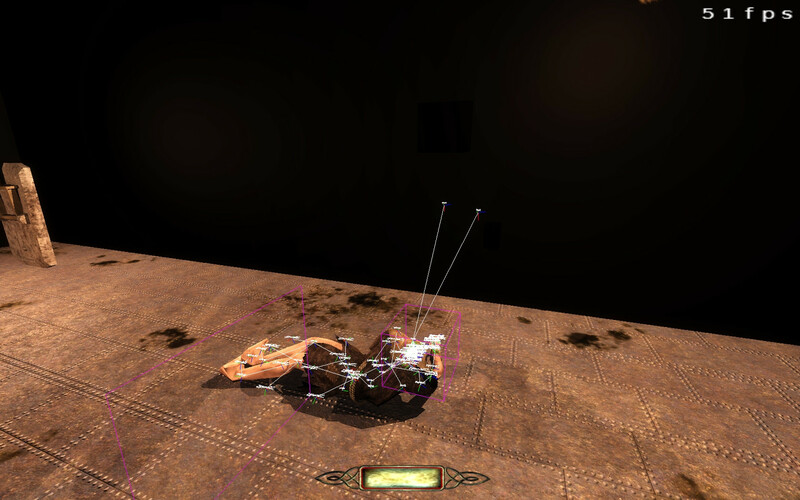 1) In Arcturus' rig bake the action onto the bone system in layer three. 3) Set bone layer to 3. Choose all the bones in layer 3 and press the ADD SELECTED button. 5) File / export MD5. Remember to uncheck the REORIENT option. Exporter works. It is seems to be more realiable than any exporter I've used thus far. Animation works. 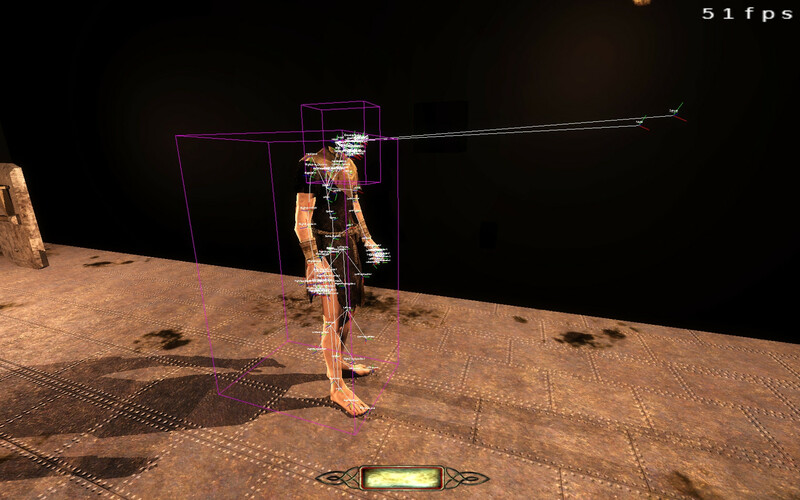 AI character bounds are correctly. No shadow anomalies. All praise the Arx EOS Exporter!! This is truly heaven sent. So does that mean you could start using blender motion capture libraries? I do not know. What's preventing the usage of such libraries? Maybe A should examine the new exporter and see if it solves the problems? I only know it works with A's rig and solves the bounding box / shadow issues. The post you're referring to is old. Since then I managed to export mocap animations. The running and jogging animations are (highly) modified CMU mocap animations. The problem is, working with those mocaps is painful. Later in the same thread I struggled to get walk animations into Dark Mod. Since mocap has key frames on every frame, doing even simple corrections is very time consuming. Since then I created proper rig in Blender and I wouldn't want to use CMU library again. Much better would be to have a custom mocap system.